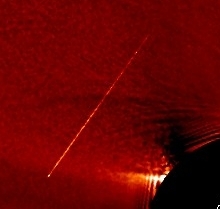 Two cosmic rays distorted by the high compression factors applied to beacon data, as seen by the STEREO Behind EUVI telescope on January 18, 2010 Same cosmic rays as seen in the full resolution data. Many more cosmic ray events are visible. Only the brightest two show up in the beacon image. On July 19, 2011, the software for generating the browse images was changed to not apply smoothing when making JPEG images that are larger in size than the original data. The smoothing, as seen in the left image above, was found to contribute to making the cosmic ray features look like artificial structures. The unsmoothed images, although not quite as pleasing looking, are more representative of the actual data.